When our customers come in for piercings, one of the most common questions we get asked about is what piercing methods we use. At Almost Famous Body Piercing, we offer both the gun (non-cartilage area of the ear lobe only) and the needle piercing method. We do use needles for all body piercings, including those on the ear lobe, but we will not use a piercing gun on any piercing other than the ear lobe. We have found that some customers prefer to be pierced with a gun, and make that specific request. If the person getting their earlobes pierced is a small child, and not old enough to sit absolutely still, it is much safer for both the body piercer and the person getting pierced to use a gun for that age group. Traditional stud and clasp jewelry is also very popular. Not every person who pierces their ear lobes will choose to wear body piercing jewelry styles in that piercing. At Almost Famous Body Piercing, we provide our customers the option of traditional stud and clasp earrings in both 14k white and yellow gold, or in hypoallergenic styles. Piercing guns are commonly used for ear piercing, and little training is required to use them. There really isn’t any necessary anatomical knowledge needed for the earlobe, and the most important factor to take into consideration is the angle of the jewelry, and whether or not the person getting pierced will be getting more ear piercings in the future. Needles are more commonly used by professional piercing studios, where a variety of piercings all over the body are offered and guns are generally not used at all, or not used on anything other than ear lobes due to the jewelry not being appropriate for placement in all piercings. The ear-piercing device we use at Almost Famous Body Piercing (which is considered a medical device) is comprised of a re-usable piercing gun, and a single-use stud and clasp earring in a sterilized blister package. The packaging for the jewelry uses the same packaging and sterilization standards as required in the medical device industry, which prohibits contamination prior to use of the sterilized item. The piercing gun is reusable because no part of the gun comes into contact with the client’s skin. The stud and clasp are left in the client’s ears. The only part of the ear piercing system that makes contact with the customer’s skin is the plastic mount or cartridge. The cartridge is specifically designed for disposal without the piercer coming in direct contact with the used cartridge. If you do get your ear lobes pierced with a piercing gun, the aftercare regimen does not change. You still have a fresh wound in your body that will need special care until healing is complete. See our aftercare guidelines here. 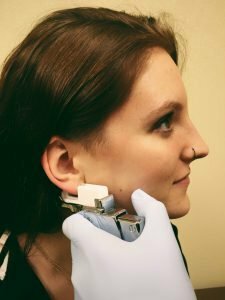 The process of using a needle to do a piercing in an area of the body other than the ear lobe is much safer, and our customers say, less painful than using a piercing gun. The needle is hollow and has a sharp point to create a clean hole. 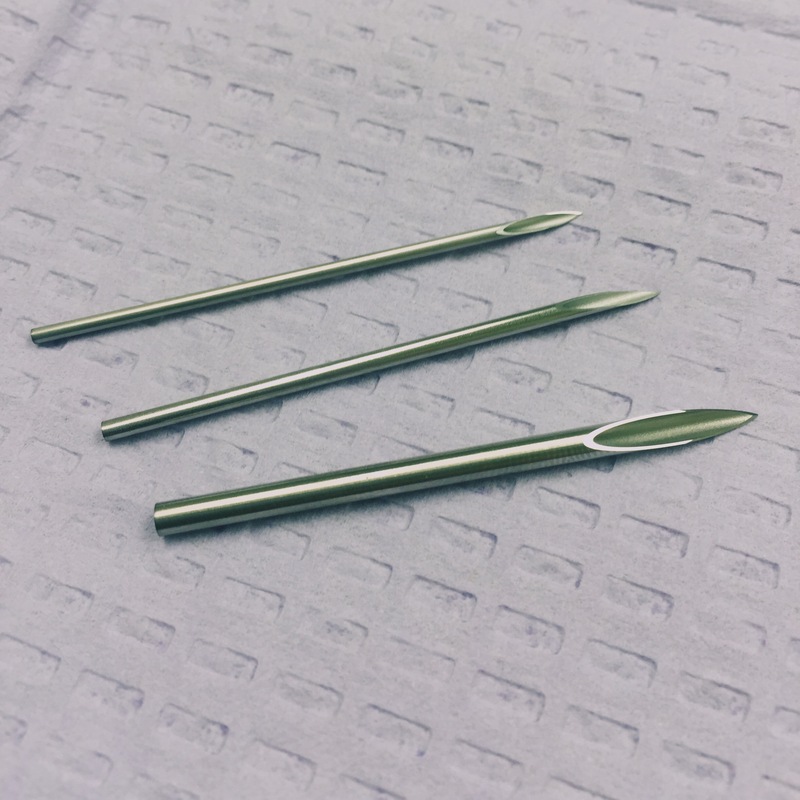 Since the needle is hollow, it removes a small amount of skin and tissue in the immediate area of the piercing wound, and creates a space for the jewelry to rest, allowing room for the wound to drain and to heal. Now, it is certainly true that many people have had piercings done with a gun instead of a needle and encountered no serious health issues. Yet when the two methods are directly compared, needles are far safer, and less painful for body piercings. Remember, ear-piercing systems were specifically designed to pierce the ear, nothing else! When you want piercings done, it’s important to go with an expert who uses proper methods in a safe and clean environment. It’s also important that the expert be familiar and trained in blood borne pathogens and infection control. As the above information shows, piercing guns used appropriately can be successful for ear lobe piercings. At Almost Famous Body Piercing we use only the safest methods for our clients. With four locations in Minnesota and North Dakota our expertise speaks for itself. Please contact us today with any questions you may have about body piercing, our products and methods.